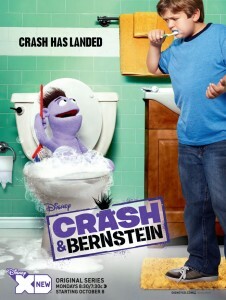 The first season of Disney XD’s popular comedy series Crash & Bernstein ends next week with a special one-hour episode, and the series returns for a second season in October. Next week’s season finale finds Wyatt Bernstein saving his puppet Crash from a Build-a-Bestie doll recall. The comedic and dynamic duo finds themselves on the run when a Bestie recall agent is sent to capture and destroy Crash. The second season debuts less than a month later on October 7 and viewers will have a chance to see more adventures with Crash and Wyatt as they create a new hangout and take on everyday challenges. Starting September 9 – the same day as the season one finale – fans will have a chance to start voting for ‘Pick Crash’s Nose’ at DisneyXD.com/Crash. The voting runs through September 15, and the winning nose will debut during the season two premiere episode “The Nose Job” where Wyatt, Crash, and Pesto try to find a place to hang out when the girls take over the house. In the episode, the friends find a cool and vacant lot they must challenge some geeky high school students to claim the hangout. As part of the season two premiere celebration, DisneyXD.com is launching the “Crash & Bernstein: Cluck n’ Chuck” game where fans – playing as Crash and Wyatt – take on the neighborhood in a battle featuring rubber chickens. Fans can play the game on mobile devices and computers. Crash & Bernstein stars Cole Jensen as Wyatt, Emmy Award-nominated puppet master and filmmaker Tim Lagasse as Crash, Landry Bender as Cleo, Oana Gregory as Amanda and Aaron R. Landon as Pesto. Recurring are Mary Birdsong as Mel, Mckenna Grace as Jasmine and Danny Woodburn as Mr. Poulos. The season one finale airs September 9 at 8:30 p.m. ET, and the season two premiere airs at 7:30 p.m. ET on October 7 on Disney XD.